As your child grows out of their low sitting potty chair, it may be time to get them a potty training seat that goes on top of the regular toilet. Some of the best training seats have a built-in ladder that allows your child to get onto the toilet easily. We have reviewed some of the best potty training seats with ladders, and this is what we have found. Our top pick is the Potty Training Seat with Step Stool Ladder by Mangohood. It offers a sturdy style but has some great, unique features. While this one is the one we picked as the best, there are some other great ones as well. Shopping for a potty training seat with a ladder shouldn’t be so daunting. Just make sure that you know what you are looking for. First and foremost, you will want to make sure that you choose a chair that is sturdy. The design is important because you don’t want your child to get hurt trying to get up onto the toilet. Safety should be a top priority. It is also important to look for a chair that will be easy to attach and remove from your toilet. After all, it isn’t really possible for adults to use the chair, so having one that will be easy to take off when you need to is pretty convenient. Finally, consider the material that is used for the chair. It is a good idea to choose a material that will be easy to clean, but also be antibacterial and nonslip. These are important features when it comes to keeping your child safe and sanitary when they are using their potty seat. First, on our list, we have the Potty Training Seat with Step Stool Ladder by Mangohood. This one is our favorite for a variety of reasons including the comfortable padded seat, sturdy handles, and pee-catcher for boys. Let’s take a closer look and see what this chair has to offer. It offers the ultimate level of safety for your child. It not only has a step ladder with non-slip feet, but it also has arm handles for your child to feel safer as they use the potty. It is easy to fold down, making it really easy for you to store it when you do not need it. It can even be hung on the back of your bathroom door. It is easy to keep it clean and is made up of non-toxic plastic that is safe for your child. It does seem to be a bit bulky when it is attached to the toilet, but this really just adds to the security of it. The splash guard is actually pretty low, which means little boys may have to push down if they don’t want to make a mess. Next, we have the Luxxbaby Kids Potty Toilet Training Seat. This seat has a fun, stylish design and is available in two different colors. Choose from either green or white. Check out some of the other features. It offers a slim design but has a pretty soft and comfortable seat that will help keep your child comfy. There are even some handles that allow your child to hang on. Being up high on the toilet can sometimes make them feel less secure, but having something to hold on to can help this. It is non-slip, making it safe for your child. It can also be adjusted to different heights so that it can fit just about any toilet. The steps are really not very wide, which may make it more difficult for bigger kids to get up the ladder. Some parents have noted that the stairs were a little bit wobbly, so make sure that they are securely locked into place before your child starts to climb them. The Ostrich Toilet Step Trainer for Kids is one of the few FDA approved potty training seats for kids. It has a great design, and it is also pretty comfortable for your child. Let’s take a look into some of the other features that make this chair unique. It is fully adjustable, allowing you to use it on just about any toilet of any height. The cushion seat is padded, so it is really comfortable for your child. It also has a large ladder base, that is made up of anti-slip material for added security. 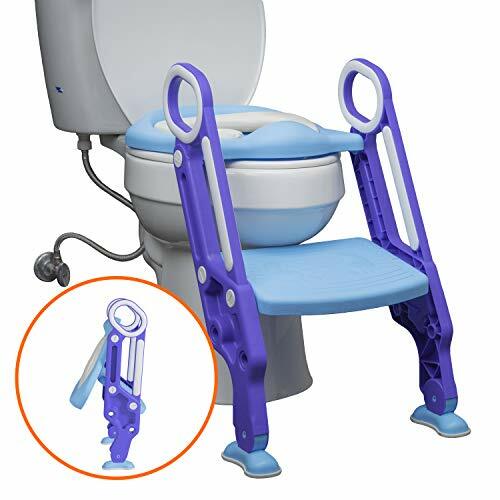 The ladder is removable, allowing you to take it off when your child gets a little taller, but still lets them use the comfortable toilet seat. The seat is really not as easy to keep clean as some of the other seats out there, because of the padded cushion. It is a bit bulky, which means it may not be ideal for smaller bathrooms. It does not offer a splash guard, which is usually a critical part of a good potty chair for boys. 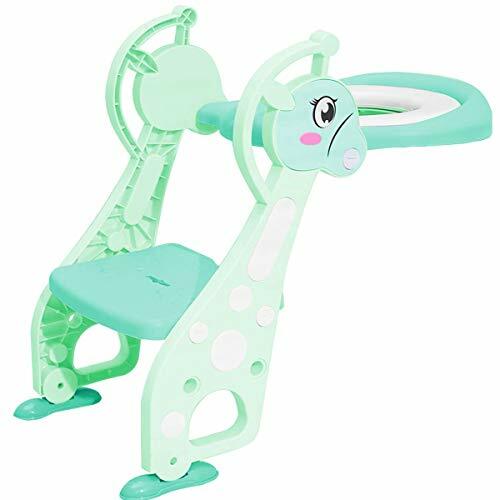 The Potty Training Seat with Ladder by Learn Laugh Love Kids is a sturdy and comfortable potty training seat for little boys and girls. It has an adjustable, wide durable step that accommodates kids of all sizes, so they’re comfortable on the toilet. This potty training seat for toddlers fits standard and oval size toilet seats. The removable soft cushion seat and splash guard make for easy cleaning. This potty training seat for toddlers is ergonomically designed. The easy-grip comfort handles and non-slip floor and seat pads are sure to keep even the most active of toddlers safe while they build confidence using the potty. The collapsible design conveniently saves you space so you can store it way while not in use, or you can take it with you on while you travel with your toddlers. 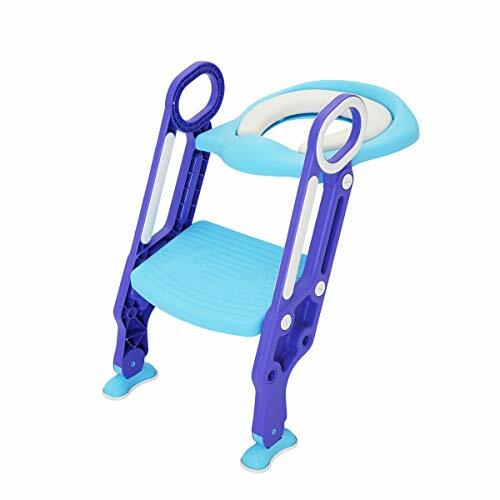 This Adjustable Baby Toilet Trainer Seat with Step Stool Ladder by CrazyLynX aims to encourage children to go to the toilet independently and gradually reduce the need for adult supervision. 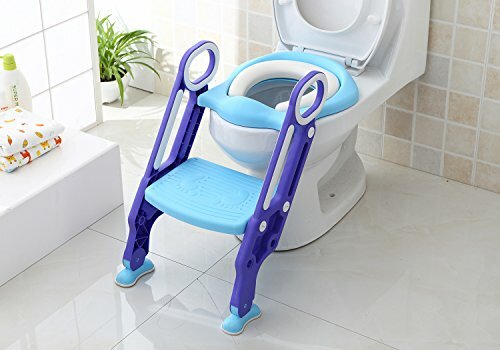 The double handrails and non-slip design are sure to keep your children safe even if they’re on their own in the toilet. This baby toilet trainer seat is very sturdy with a maximum load weight of 166 lbs. 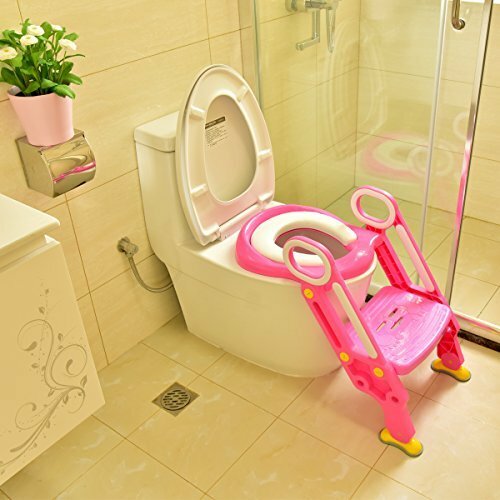 Its adjustable pedal can be rotated to conform with your baby’s height, as well as the toilet’s. The step stool ladder is suitable for kids ages 1-7 years old. The baby toilet trainer seat is applicable for most toilet types including V shape, U shape, and O shape toilets. The soft cushion seat is made of polyurethane which makes it water and mold proof. The material also makes the cushion immune to cracking. The foldable, compact design is a space-saver and makes for easy storage. 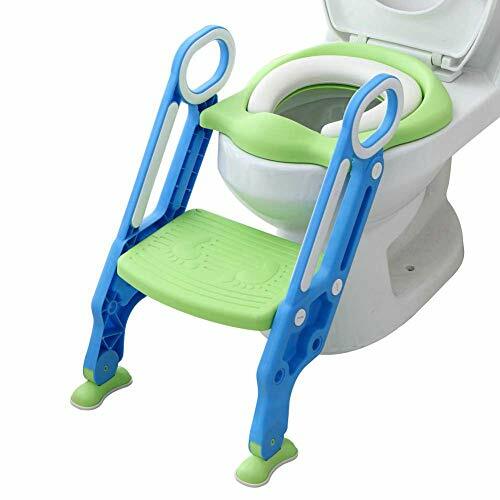 The Iapetus Potty Toilet Training Seat with Step Stool Ladder is a newly upgraded baby potty training toilet with two-sided handrails which makes it safe and practical to use. It has smooth contours and its anti-splash design is in line with ergonomics. The high-quality and high-density pp material makes it very sturdy. This potty toilet training seat has an adjustable, anti-skid footrest and footpads for your baby’s safety and comfort. The PU material on the soft cushion makes it easy to clean and is not easily deformed. The upgraded anti-slip double handrails ensure your baby’s safety and comfort. The Iapetus Potty Toilet Training Seat has passed CPC, FDA Certification and ASTM test report. It is built to last and is guaranteed to help your toddlers learn to use the potty independently in a safe and comfortable manner. The Step Stool Ladder is recommended for kids ages 1-7 years old. This toilet training seat comes in two different colors. The blue one is for your little boy, and the pink one is for your baby girl. 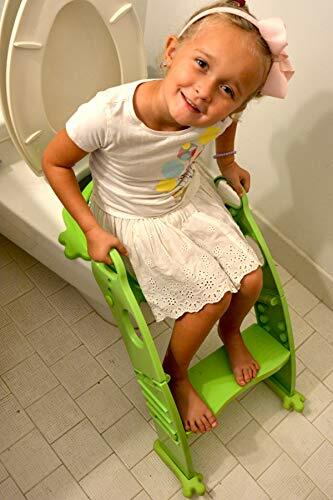 The Makone Potty Trainer Seat with Step Stool Ladder is a 3-in-1, multi-purpose designed potty trainer seat that helps train your children to use the toilet just like adults. It satisfies your children’s needs and let them learn proper toilet etiquette just like adults. The Makone Potty Trainer Seat is made of durable, thick material which is recommended for house usage. The soft pads make your baby’s potty training comfortable and safe. The double-sided handrails are practical handles for grasping while the unremovable, anti-skid pedal ensures that your children don’t fall off or slide off the potty trainer seat. This potty trainer seat comes with an optional soft pad that is water and mold proof and is easy to clean. The adjustable, anti-slip footpad can be adjusted up and down according to your baby’s height. There are also six non-slip pads at the bottom of the cushion which make sure that the potty trainer seat doesn’t move even when your child moves a lot. Moreover, it’s collapsible, user-friendly design can save you a lot of space. Boy with potty chair and ladder to big boy bowl. There are a lot of great potty training seats that have ladders, but these are definitely some of the top choices that we found. We really liked the Potty Training Seat with Step Stool Ladder by Mangohood because it has a super safe design, and also has handles to ensure that your child feels safe and secure. However, all three of these are good quality options and part of the buying decision is obviously personal taste on color, size, and style depending on your bathroom. It is also easy to clean and can be stored easily behind your bathroom door. While we do like this one the best, you are sure to find that any of these top picks are great choices. If you’re not sure your child is ready for the ladder, you could just get a potty chair that sits on the bathroom floor. We’ve reviewed our best potty chair choices separately for boys (with pee splash guard) and top picks for girls potty chairs (no splash guard).